The Toro y Moi concert is one of the many shows celebrating the venue’s 10th anniversary. The New Parish is celebrating a milestone: The downtown Oakland music venue is turning 10 years old. Since its inception, there have been many changes to the neighborhood that houses The New Parish — the one thing that has not changed is the venue’s commitment to nurturing local acts. “Our booking reflects what the Bay [Area] is,” said Michael O’Connor, owner and booker. 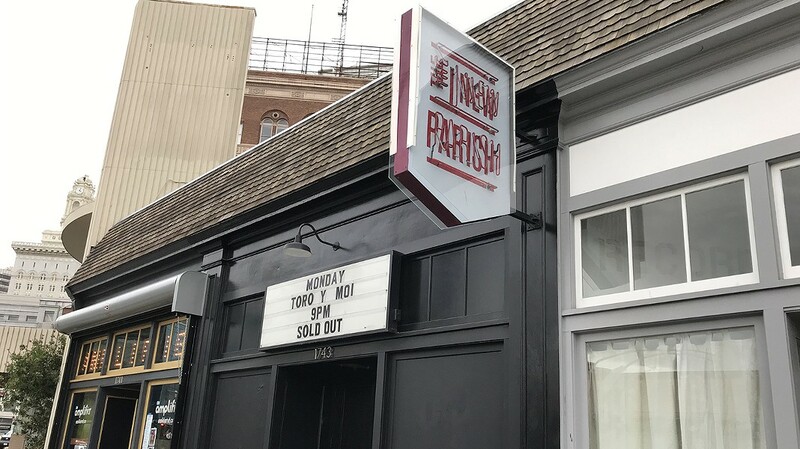 To celebrate the occasion, the venue has a string of big-name shows, including many artists who originally got their start at The New Parish. Toro y Moi just played a sold-out show and superstar G-Eazy has an up-coming sold-out show, from which 100 percent of the proceeds will benefit Nova Phoenix’s Leukemia Recovery Fund and the rapper’s own Endless Summer Fund, which supports LGBTQ youth, homelessness, education, and mental illness. Other music superstars playing a show include Kamaiyah, Too $hort, Celso Piña, and Grammy-award winning Fantastic Negrito. O’Connor was not only born and raised in San Francisco, but the entrepreneur is a self-taught booking agent with a long list of accomplishments that have profoundly influenced the Bay Area music scene. Many younger music heads might not know that O’Connor successfully ran Justice League, the music venue in San Francisco that is now The Independent (of which O’Connor remains a partner). It originally opened in 1997. In his younger days, he also ran Mr. Five’s Club, a jazz/hip-hop venue that was on Market Street. The idea to create The New Parish dates back more than a decade. In 2002, when O’ Connor closed the Justice League his goal was to bring that name and vibe over to the other side of the bridge. Fun fact: the venue’s original name was going to be The Town Hall of Oakland, to pay homage to Oakland’s nickname, The Town. O’Connor had to forego the name after he was sued by Town Hall restaurant, the upscale tavern on Howard Street in San Francisco. “It was incredibly ridiculous,” said O’Connor of the lawsuit. While for many, parish alludes to a term used in the Catholic faith, O’Connor explained that in New Orleans and the Caribbean, parish is the word for county, and not a religious term. “So we are saying, ‘This is a new part of town,’ even though it’s not really new,” he explained of the revival of the neighborhood, which at the time when the venue opened, had not taken off. Early-goers probably remember some of the very first shows at the venue, with comedian Dave Chapelle playing several underground, not properly promoted events — all of which sold out despite the lack of marketing. “I think that the first year that we were open, Chappelle played around 50 shows,” said O’Connor, noting how successful those stand-up comedy performances were. “The first real show was this artist that I really like, not really popular, named Alex Cuba and Bobbito,” he fondly remembered. “One thing about The New Parish is that we are really actively and aggressively trying to develop and book local talent,” added O’Connor about the venue not focusing on being a national touring club. “Oakland is so interesting and exciting. We are helping develop talent; many have played their break-out show here.” Some of those include Kehlani, along with the California Honeydrops. The venue, of course, is not limited to live music. It also caters to DJs who want to have a recurring event — as was the case until recently with the Wormhole Wednesday collective. At a time when venues in San Francisco were mostly focusing on live acts and not giving DJ collectives a chance, O’Connor knew that he wanted the Oakland venue to be different. “One thing that The New Parish has also been about was [giving] parties like Ships in the Night, Wormhole, thepeople, Reggae Gold, [the access] that for five or 10 bucks, you can come and it’s not a touring show.” He noted the need to give space to folks who enjoy DJ acts the same access as those who prefer concerts. Last summer, the venue’s management changed when partner, Jason Perkins, departed, and Parish Entertainment Group dissolved. O’Connor now partners with Another Planet Entertainment. APE exclusively books The Independent, while also booking shows at the Fox Theater, the Greek Theatre, and Outside Lands music festival. Many were worried about the prospect of Another Planet Entertainment booking acts at The New Parish and how it might affect local performers, but O’Connor still books all the shows. “It was important to partner with one of the bigger companies,” said O’Connor of the venue’s working relationship with APE. “It has worked out, and I continue to be the booker. The booking is not going to change in any drastic way.